It has been the wettest winter on record here in western Washington. After a long summer drought complete with wildfires, Mother Nature decided to even the score this season with incredible amounts rain and snow resulting in numerous rock slides and avalanches. Today was a typical example of predictable unpredictability in the weather. I knew it was going to rain, I just didn’t know exactly how much rain would fall at any given time today. 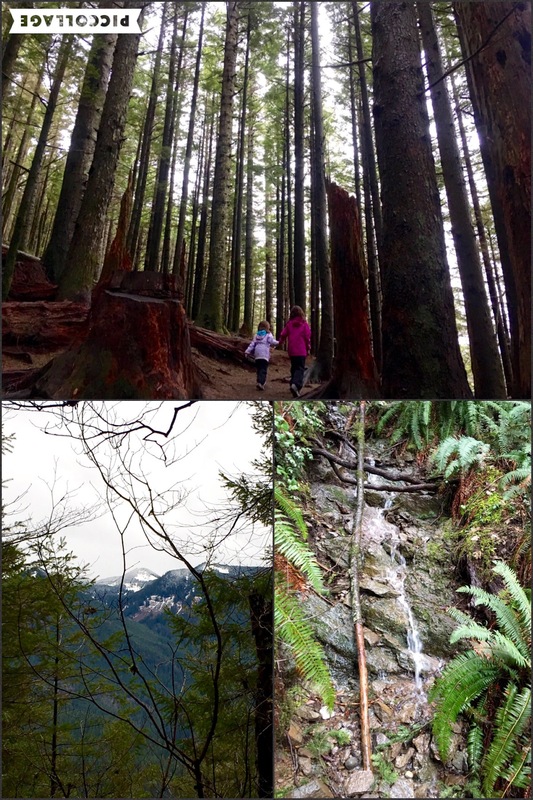 But, I also knew I couldn’t spend another day during this week-long school break cooped up inside with my junior hiking buddies. After all, rain is just water. We live with damp, grey skies nine months of the year, and we haven’t yet dissolved during our seven years in the Pacific Northwest. 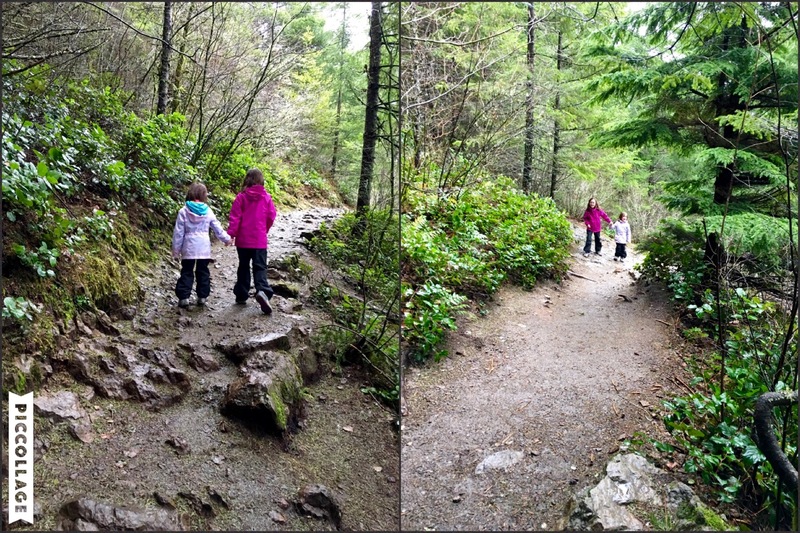 From Lake Serene to Licorice Fern Trail, we three have hiked under wet conditions at some point. By golly, a little water today wasn’t going to keep us from the trail! 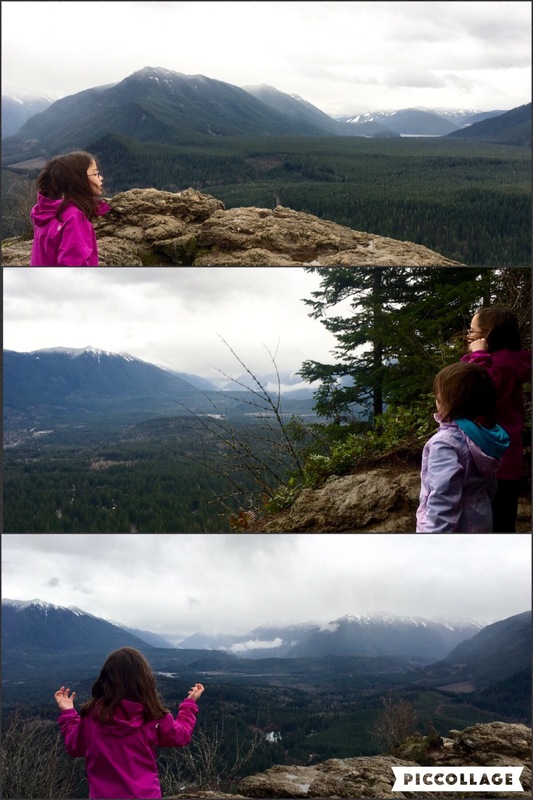 The girls and I headed out to Rattlesnake Ledge for a mid-morning hike. Sharing just one load among the three of us, I packed only the minimum essentials in my smaller day pack. My intent was to lighten everyone’s load in the event we needed to hasten our return trip under weather changing conditions. Having been been up to the ever-popular Rattlesnake Ledge more times than I can keep track at this point, I was pretty sure of our route and prepared for most anything the girls might need (i.e., extra layers, food, water, and more food – yes, I already said food, but I really mean enough snacks to keep them moving!). 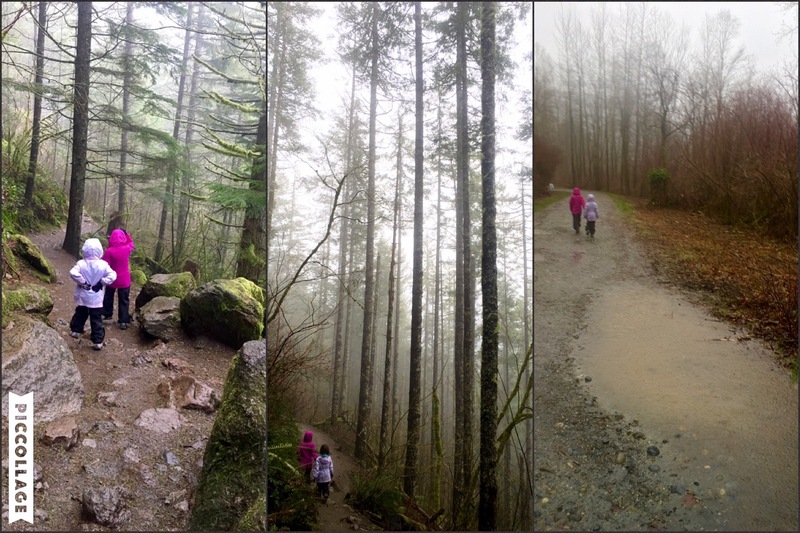 Rattlesnake Lake today (above) and on a sunnier day (below). Same tree, under different light and weather conditions. 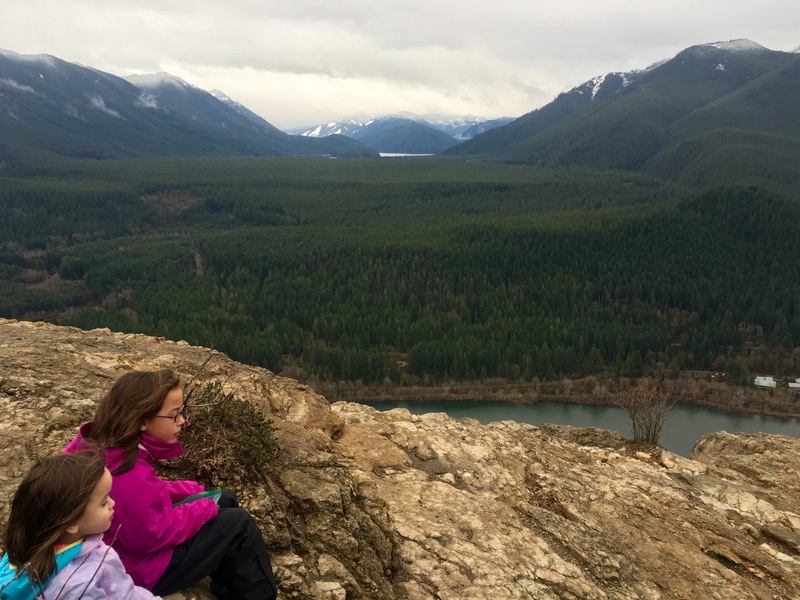 Rattlesnake Ledge is one of the first trails we explored as a family all those years ago when I still had to be dragged outdoors. Now, it’s one of my regular midweek routes while Little Hiking Buddy is in school. I’ve made it up to the Ledge beneath brilliant bluebird skies, following an icy trek through the upper slopes, and under the wettest of conditions. Even LHB has been up there on her own two feet! Truth be told, I also really wanted to break Big Hiking Buddy (and myself) free of PooPoo Point. Literally covered in water-proof gear from head to toe and limb to limb, we three headed to the old logging road just before 11:30 am. The clouds were dark and barely holding back their watery burden. As we entered the tall forest, a slight drizzle came down upon us. The overhead canopy of branches protected us from the full effect rain and, thankfully, continued to do so throughout much of our hike. The girls didn’t seem to mind the rain at all on our way up. They counted boulders, explored moss and roots, and challenged themselves by climbing over tougher terrain when easier options existed. As always, there were lots of songs, arguments and chatter throughout our slow(er) ascent. 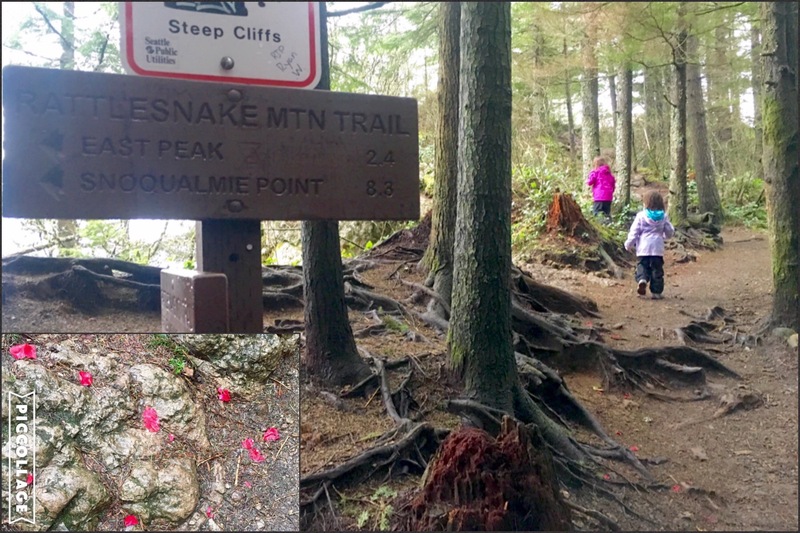 As mentioned, I’ve been to Rattlesnake Ledge so often now that I’ve found ways to challenge myself with different routes up the trail. 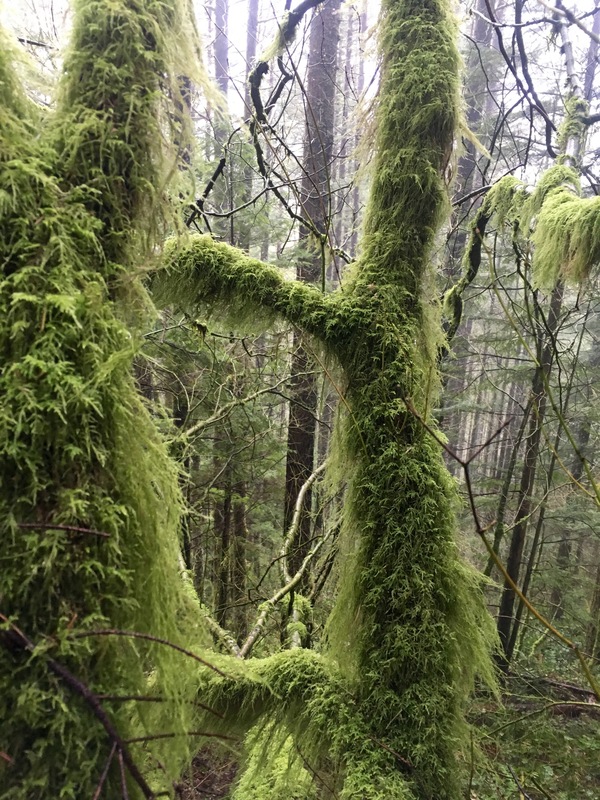 I’ve even found an all-but-abandoned climbers trail that has taken me up a steep, rocky path deep into the forest. Knowing my way better than the girls, I took a minor shortcut before one of the switchbacks and took them by surprise as I popped out before them when they turned the corner. Shock, then confusion, finally laughter abound. This simple act of silliness set the lighthearted tone for the remainder of the trek up. 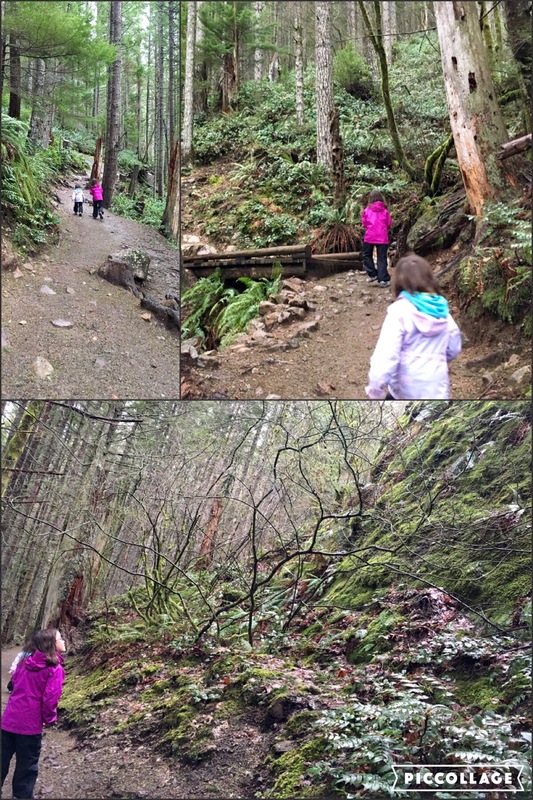 I’ve come to realize that half the challenge of hiking is in one’s head; and with my girls, the fun has to far outweigh the distance and elevation. We made our way to the cliffs just in time to see overcast skies outlining the snow-crested peaks of the Cascades around us, both near and far. Thankfully, true to the weather forecast, there was a brief break in the rain; and we had timed our ascent almost precisely. In the near distance, we could distinctly see Mt. Si, Mt. Teneriffe and Mailbox to the north; Mt Washington, its sister peaks and Chester Morse Lake directly east; along with Rattlesnake Lake itself immediately below us. The girls couldn’t believe they were actually up on the bluff, the very ones they’ve seen through the car window on our many trips east. BHB was so enthralled by the view, she felt the need to shout out her love of the mountains to the valley below. Eastern view of Cascades, with Mt. 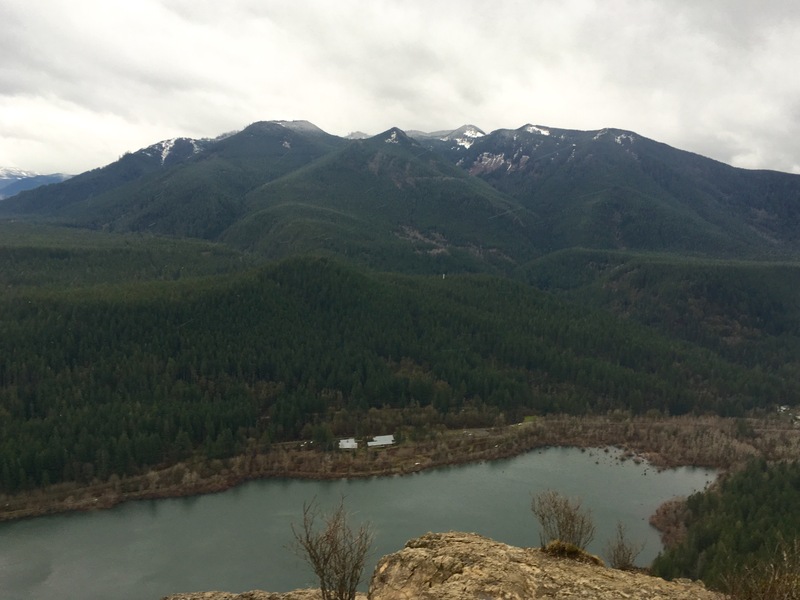 Washington, Chester Morse Lake and Rattlesnake Lake in the near distance today (above) and on a sunny day (below). View of Mt. Si, Mt. 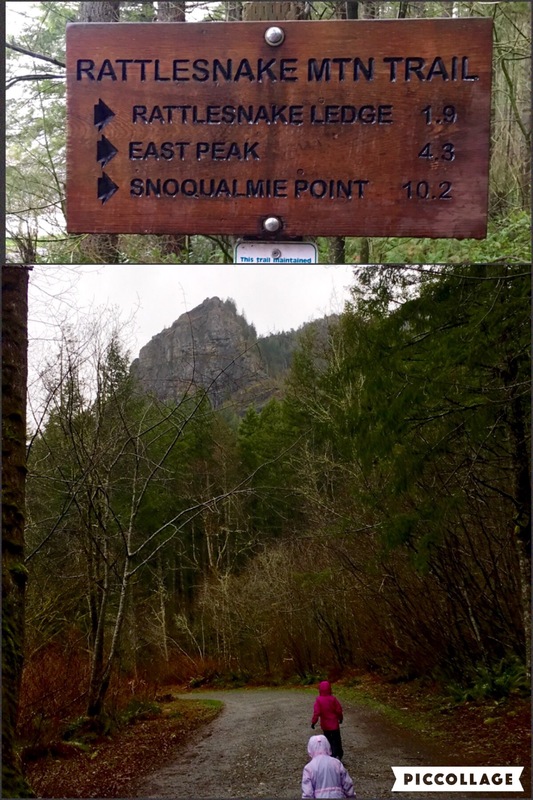 Teneriffe and Mailbox Peak from today’s rainy day (above) and from another sunny day (below). We carefully scrambled over the bluffs to the lower ledge to find some protection from the blustery wind. The girls emptied their lunch sacks in no time, knowing treats of small-batch kettle chips and homemade brownies were in store once they finished their fruits and vegetables. I enjoyed hot coffee from my ever-present thermos along with my dessert. As cold and damp as they were, the girls were happy as can be knowing they had made it to the top on this dreary day. Mighty girls deserve chocolate! Unfortunately, we could see the rain move in as the heavy clouds began to cover the summits all around us. 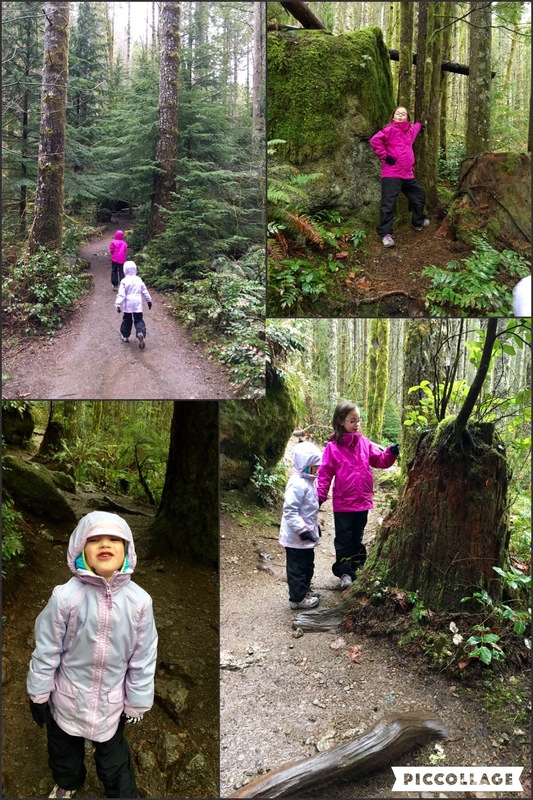 We three quickly headed down the trail back under the protection of the forest and did our best to survive the downpour unscathed. By the time we made it the trailhead, the clouds couldn’t bear their burden any longer and completely unleashed rain on us as we ran to the car. We didn’t even bother to strip ourselves of our rain gear for fear of being washed away. Ironically, the fresh rain had rinsed our shoes clean of mud, so we needed just to change into dry clothes in the warmth of the car. A quick drive and we were safely home with plenty of time for an afternoon movie, a cozy snuggle on the couch and a beer for me. Happy Friday!